Georgia Odyssey is excited to offer a new tournament program book this year. 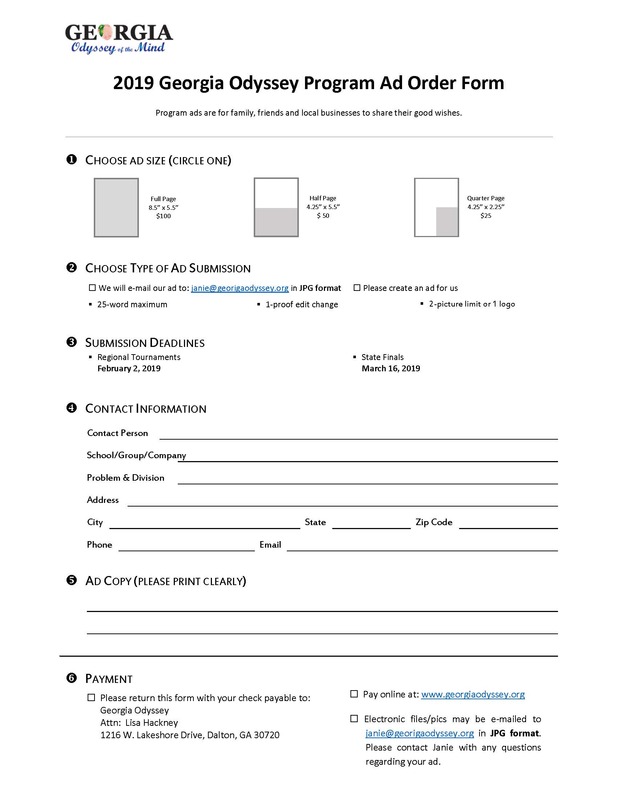 This new and improved program gives you the opportunity to purchase an ad so you can send a special message to your team or an individual. It is also a great way to promote your local business. Ads will be full color and can have a maximum of 25 words. There are two opportunities purchase space in the program. 1. Regional Tournaments: Each ad purchased for a regional tournament will appear in all three regional programs! Ads must be purchased by February 2, 2019. 2. State Finals: Each ad purchased for state finals will be included the state finals program. Ads must be purchased by March 31, 2019. Ads will be ordered through the website here. You may purchase by sending us a check or quickly pay with a credit card. Either way, simply complete the checkout process here to complete your order. You may send us a fully designed ad OR our talented designer can assist you in creating one. Please Send all ad documents (images, logos, text) to janie@georgiaodyssey.org Make sure to include your order number with the submission for tracking purposes! We also have a document upload option here available for use.